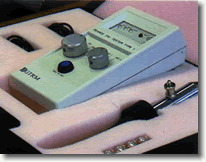 A durable hand-held IRJ tester that is designed for non-intrusive testing of IRJs. This tester has been approved for use on Network Rail Infrastructure (certificate no. PA05/391) and comes with two magnets and a probe. The testing kit comes in its own carry case to help keep it protected and make it easy to transport in the field. PEARCE INSULATED RAILJOINTS (IRJ,S), THIS DEVICE MUST ONLY BE USED ON IRJ,S FITTED BETWEEN TWO DC TRACK CIRCUITS OR DC TRACK CIRCUIT TO NON TRACK CIRCUITED JOINTS.